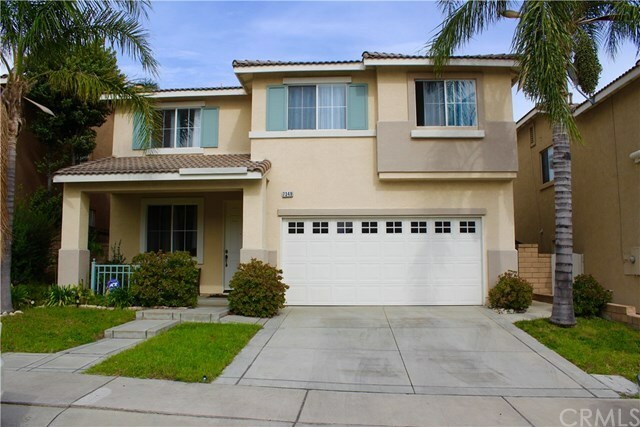 Welcome to your new home in a very nice gated community of Village Independence. This a beautiful well maintained home with 5 Bedrooms and 3 Full Baths, bedroom with full bath downstairs for guest or elder family member. Master bedroom and one of the secondary bedroom are huge and a place for seating area or study. Hardwood floorings throughout, neutral paint, concrete backyard, water heater, ceilings fans, all were installed mid last year. All 3 Full Bathrooms has tile floorings. No maintenance patio with fruit bearing trees like lemon, apple, loquat. All window treatments are included. Two car garage with 2 carport. Award winning school district with high ratings (Terra Vista Elementary-10 rating, Etiwanda Intermediate School-8 rating, and Rancho Cucamonga High School and Los Osos High School- both has 9 rating) Few minutes to freeways (15/210/10), shopping and restaurants in Victoria Gardens. This is truly a move in condition property. Sellers are very motivated!!! Directions: From Foothill Blvd or Baseline, take Rochester and enter to Revolution gate or in Mountain View gate.